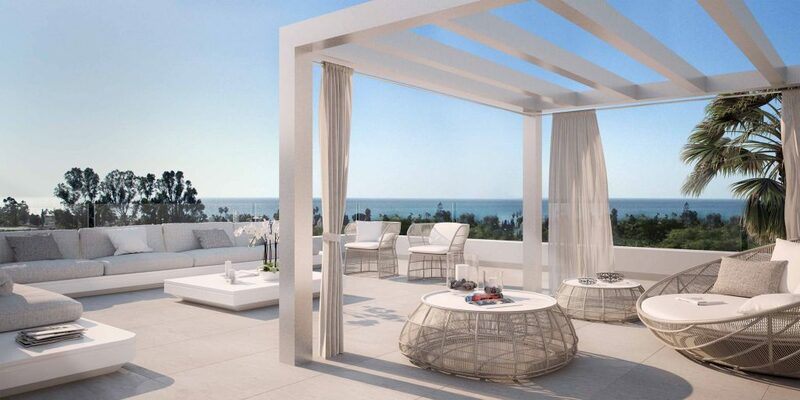 The New Golden Mile stretches from Atalaya to Estepona and it is one of the coast’s more popular residential areas. It benefits from not being over-developed and providing access to great beaches as well as the countryside, and there are some great walking and horseback riding trails in the vicinity. The urbanisations and residential centres along the New Golden Mile are well established, which means you can be sure that there is a strong community here, with all the amenities required, such as hospitals, medical centres and international and state schools. It is also known for its fabulous selection of restaurants offering a wide range of ethnic cuisines and has many popular bars and cafés. It is also one of the areas where you can get the best new build modern properties, especially if you want to live beachside. Here are just two of the fantastic contemporary residences we have for sale on the New Golden Mile. This three-bedroom apartment is located in a modern gated development on the New Golden Mile. It is close to plenty of services, amenities and some of the best golf courses around, and is just a kilometre from the beach. The accommodation consists of three generously proportioned bedrooms, two bathrooms and a spacious open plan kitchen, which is integrated with the living and dining rooms. Only the finest materials have been used, such as porcelain floors throughout. Owners have the exclusive use of well-tended grounds and gardens and a saltwater swimming pool. Air-conditioning, storage and a parking place are included in the sales price. We can also show you a luxurious three-bedroom, two-bathroom penthouse located in a desirable area beside the fantastic Atalaya Golf & Country Club, halfway between Marbella and Estepona. The luxury penthouse apartment is built for modern living and is designed in a contemporary style with modern straight lines and light colours. The interior areas are spacious and full of natural light thanks to the use of floor-to-ceiling glass sliding doors. It features a spacious, fully fitted and equipped kitchen, which is unified to the elegant living/dining room. The living area also offers direct access to a terrace and solarium, which are blessed with amazing sunsets. This stylish penthouse comes with garage space for three cars plus a storage room. The complex also has a community salt water pool, gym and running track. We have many more properties in this location for you to look at. Please contact us to discuss properties for sale on the New Golden Mile.